Those awful Mets play in Houston tonight with lefty Jon Niese on the mound. Niese in a stint I'd already forgotten ever happened this year wore No. 49 and is still available for him. To make room on the roster the Mets got around to disabling Gary Sheffield who naturally isn't happy about it. Like the next guy I'm interested in seeing how the whole Tony Bernanzard drama plays out, not because I think he's the devil, necessarily, but because how it unravels might reveal something of how this ridiculous organzation works. As I understand things, Bernazard at this time last year looked as if he might be the future king of the Mets, only to see Omar Minaya get the contract extension after the year. With some conflicting reports arriving as to Bernazard's behavior I'm wondering who the sources are and what their motivation is. I also wonder if it wouldn't have been even better had he taken his pants off. Thanks to everyone who showed up Amazin' Tuesday this week at Two Boots. Newly linked blogger Section Five Twenty Eight has a terrific account of it. We're doing it again on August 25 (I'll miss that event but I'd urge you to attend anyway) and on Sept. 15. Words that rhyme with "Cory." Outfielder Cory Sullivan has been recalled from AAA Buffalo in place of Fernando Nieve, the latest Met to suffer a debilitating injury. Sullivan wore No. 12 in spring training but that number went to the newly acquired Jeff Francoeur ; so instead the Mets offered Sullivan the No. 19 jersey most recently belonging to Ryan Church. P.S. -- Thanks for the tip, Metsgrrl. If Marlon Anderson were alive today, he might be distributing his teammates worksheets with the number 45 written on it. Maybe even 50. Those look to be the minimum of the remaining 75 games the Mets are going to have to win if they hope to have any shot at postseason baseball. Forty-five wins is an even .600 winning percentage and would get the Mets only to 87 wins for the season; 50 wins would make for a sizzling .667 clip and 92 wins. Ninety-two was the magic figure that Marlon Anderson suggested the Mets shoot for when they were floundering at 30-32 and had 100 games left to play last season: a .620 winning percentage. Then as now, the Mets were in fourth place leading only Washington in NL East. They of course fell short of that goal but it took an extraordinary collapse to do it. The advantage this season? 6.5 games out of first place, instead of 7.5 games back last season. Tall order? For the Mets, you said it. But in the spirit of giving us all some hope, I'm not putting it past the SHaMs: The Second Half Mets. Hey, why not? The incremental improvements have already begun: Angel Berroa was last seen hitting .136 and wearing No. 14 for the Yankees. But for the Mets, the 2003 rookie of the year and former teammate of Carlos Beltran, represents a clear improvement over the again-demoted Argenis Reyes and will allow Alex Cora to take the days off he so obviously needs. Anything that gets the Mets back to Jose Reyes better than they've scuffled without him so far is real improvement. From here, we can look forward to additions right through deadline season: Reyes, Beltran, Delgado, Maine. Wagner. A streak or two you know this team might find in it. Let's Go SHaMs: Fifty to go. Don't forget to join me, Greg Prince, Paul Lukas, Matthew Silverman and a barful of hungry Mets fans as Two Boots Tavern presents AMAZIN' TUESDAY, next Tuesday, July 21 at 7pm. Present a Mets baseball card for your first drink free! Pizza and Rheingold specials, Mets-Nats game on the big screens, memorabilia, giveaways and presentations! So as we saw last night in his Mets debut, Jeff Francoeur wore No. 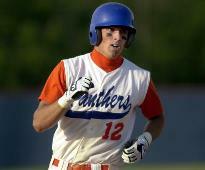 12, becoming the first Met to wear that jersey since Willie Randolph left town. I didn't think to reseach it beforehand but as you can see in the jocky images below, 12 was Francoeur's number in both baseball and football at Parkview High in Atlanta (the school actually retired the jersey). Go Panthers! When he debuted with the Braves in 2005, 12 belonged to catcher Eduardo Perez. No. 4: I like this one: Single-digit, tossed around amongst a bunch of bums ever since Robin Ventura left town eight years ago. No. 6: Nick Evans was just demoted -- Angel Pagan returned from the DL -- and the addition of Francoeur does Evans' future no favors. But I like 6 as a scrubeenie signifier and would hate to see it wasted on a guy we'll come to remember -- good or bad -- as much as Francoeur. Didya know he's under team control for one more than Chuch? Oh yes. He's our right fielder through 2011 if we want him, and maybe if we don't Gulp. No. 8: Still sitting there. No. 12: Still unissued since Willie Randolph's departure but more of an infielder's number. No. 19: If there's something to admire about this deal off-the-bat is how brazen a challenge trade it really is: Both right fielders, both considered disappointments, both teams in the same division, both more or less fighting for the same goal. Why not make it a true Del Unser Deal and change up the jerseys as well? No. 27: Available even though we'll probably need Nelson Figueroa again. This, 47, and 77 are the easiest to imagine emerging from the 7 family if Francoeur prefer to stay with it. Nos. 30, 32, 35 and 40 are open as well. As for the trade, I fear it: It seems that if Church only played a little better he'd not have been traded to begin with but it takes more ignorance of on-base percentage than I'll ever have to think we haven't just made a bad offense even worse. That said, Francoeur is right-handed and young and may still become something; while Church, for whatever reason, has fallen out of favor with two clubs already. In other troubling news they brought back Argenis Reyes when overmatched youngster Fernando Martinez went on the disabled list. And before I ever had a chance to enjoy his demotion. Now that it looks as if injuries and an underperforming second defense will be the things that kill this Mets team dead, here comes Oliver Perez. The enigmatic lefty rejoins the rotation tonight against the Dodgers -- I'll be watching up in Section 521 if you want to say hi or commiserate. To make room the Mets returned Argenis Reyes back to where he belongs in Buffalo. His legacy as a No. 11 may be a pointless turn as a leadoff hitter that hastened the Mets' demise and eroded even more of my confidence in Jerry Manuel, who I liked a lot only a few months ago. Seems that Manuel has become trapped in a device of his own making. While his team was at full strength he opted to play passively so as to build for a second half, only to find that second half just may arrive without the horses. If this team is teaching us anything perhaps it's to consider the possibily of disaster down the road before one pinch-hits one catcher for another with the winning run on base, or employs character-building but ultimately foolish strategies like sacrifice bunts as often as Jerry did early this year. That, and, you know, the value of catching the ball when it's hit to you. With that out of the way, who wants to get together and watch more of this team? Last month's Metstock gathering at Two Boots Tavern was a great success with a roomful of Met fans meeting, greeting and eating while hearing readings from three Mets-related books including mine. Owner Phil Hartman was so jazzed about its success he's asked Greg Prince and myself to organize similar monthly gatherings featuring literary readings, game-watching, consciousness raising, pizza eating, Rheingold drinking, cocktail shaking, Yankee baiting, memorabilia gawking and seven steps support as needed. The first such "Amazin Tuesday" is scheduled for July 21 at 7 p.m. and will feature guests including Paul Lukas, ESPN columnist, Met fan and creator of the incomparable "Uni Watch" and author Mathew Silverman, who co-authored MBTN and more recently, Shea Goodbye with Keith Hernandez. Two Boots is located at 384 Grand Street on the Lower East Side. Any more questions, just ask -- hope to see you there! This weekend, all Major League Baseball teams will commemorate the 70th anniversary of Lou Gehrig's "Luckiest Man" speech and raise awareness and funds for the disease that took his life and would come to bear his name, amyotrophic lateral sclerosis (ALS) or Lou Gehrig's Disease. Seventy years later, ALS still has no known cause and no known cure. My sister Jennifer was diagnosed with ALS last year. On tomorrow, July 4, each home team in Major League Baseball will host an on-field reading of Gehrig's farewell speech during the 7th Inning Stretch. The below clip -- the only surviving video of the moment -- is only a portion of the talk he gave. In addition, all players will wear a "4-ALS" patch. Local chapters of the ALS Association are sponsoring programs to donate based on the number of hits your favorite team amasses on July 4, but support for care for patients and research on the disease are needed at all times, and I hope you can join me in making a contribution. On a related note, I only recently read Jonathan Eig's terrific biography of Gehrig, LUCKIEST MAN, and suggest you should too. Neither mauldlin nor worshipful, it paints Gehrig's nievete and dorkiness as sharply as it illustrates his extraordinary strength and his value as a teammate. Way to stick it to the Cardinals, fellas. Tonight's beatdown included the return of reserve middle infielder Argenis Reyes to the team, who stepped in for lefty Jon Switzer (and hopefully won't stay for too long). And despite his former No. 4 being made available by this week's designation of Wilson Valdez, Reyes suited up instead in No. 11. But the news on Reyes is what he wasn't wearing a few weeks back with AAA Buffalo. Yes, he went to the disabled list with injuries related to taking a shot in the onions while not wearing a cup. Breaking: Elmer Dessens to be the first Met ever to wear No. 64. Just like me to predict the Mets are poised to make a run as they approach new lows. Following a rain-soaked, dreary series with the Rays at home, the Mets on Monday placed Carlos Beltran on the 15-day DL with knee trouble and moved to patch a beleaguered with a series of moves. Fernando Martinez was recalled to take Beltran's spot and was reacquainted with the No. 26 jersey he wore when he was sent down to Buffalo last week. In the meantime pitcher Ken Takahashi was outrighted to Buffalo and and infielder Wilson Valdez was designated for assignment as Elmer Dessens and Pat Misch werecalled to the big club for the first time. Dessens, a veteran starter, had been closing games for Buffalo with some success. Misch is a lefty who struggled in a few tryouts with the Giants when the Mets swiped him on a waiver claim earlier this month (he's struggled in Buffalo too).